Note from GuitarAttack: Cool...getting a bass from your boss is almost as good as getting a raise, but not quite! I've been wanting to get my hands on a bass kit of some sort for a while for the sake of having one around as I anticipate work that would involve playing a multitude of instruments, and since I'm not "real" bass player I figured I would take on another guitar project, this one being my fifth or sixth... something like that. Anyway, I had been very interested in the Ernie Ball copy kits from byoguitar.com, but when my boss for the summer decided he didn't want to build or keep his Saga P-Bass kit and handed it to me, I figured best not to let the kit go to waste! I ordered a can of Inca Silver from Dakota ReRanch and two cans of clear. I decided to forgo using a primer as I find that it allows some of the grain to show through, even with a block color, and adds depth and character to the instrument. 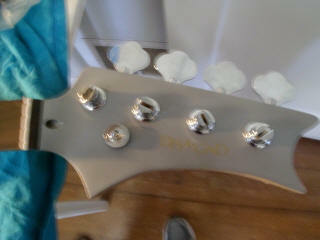 The headstock logo I ordered from Best-Decals.com. While their decals are essentially stickers and cannot be clear coated over, I've had great experience with their products lasting a long time, they look good and are fairly cheap (good for a college student). Took about a month for the finishing process all told, with a week between color and clear coat and two weeks after the clear coat before assembly. Aside from some spots where I sanded off some of the silver in prep for the clear (fortunately pretty much out of sight...) the process went really well. I wet sanded with 600, 1000, 1500, and 2000 and while there are some odd elements to the finish, it looks very nice and is almost mirror smooth. The assembly went mostly without a hitch, but I found that for some reason Saga hadn't drilled the bridge grounding wire channel correctly, and there wasn't enough space for the copper wire AND the insulation... So I removed the insulation and continued as per usual and will hope for now that the bass doesn't turn into a radio antenna, it would be a bummer to have to dig up a drill extension big enough to re-drill the channel. Saga also dropped the ball on about three screws, but replacing screws for the pick-guard and one of the tuning machines wasn't too bad. However, the tuning machine for the G string in temperamental at best so I'll either be replacing the tuning machines at some point down the road or hope that it holds up well enough. Considering that the kit was a gift, I'm not too set on the need to make the kit perfect, and I think the results speak for themselves. It has its faults of course, but the kit turned out better in the end than it looked like it might at times, and I definitely plan to find a use for the instrument. 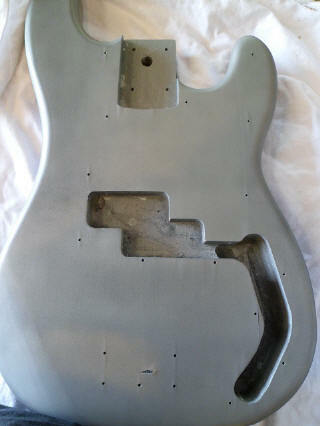 Great job, Lex -- Our favorite 60's Fender color!